Madeline Finn does not like to read! Not because she doesn't want to read, but because she finds reading tricky - sometimes the words get stuck and people giggle at her when she tries to get them out. More than anything Madeline wants a gold reading star, but everytime she reads out loud all she gets is a keep trying sticker instead. When her mother takes her to the public library the librarian, Mrs. Dimple, has a wonderful surprise. 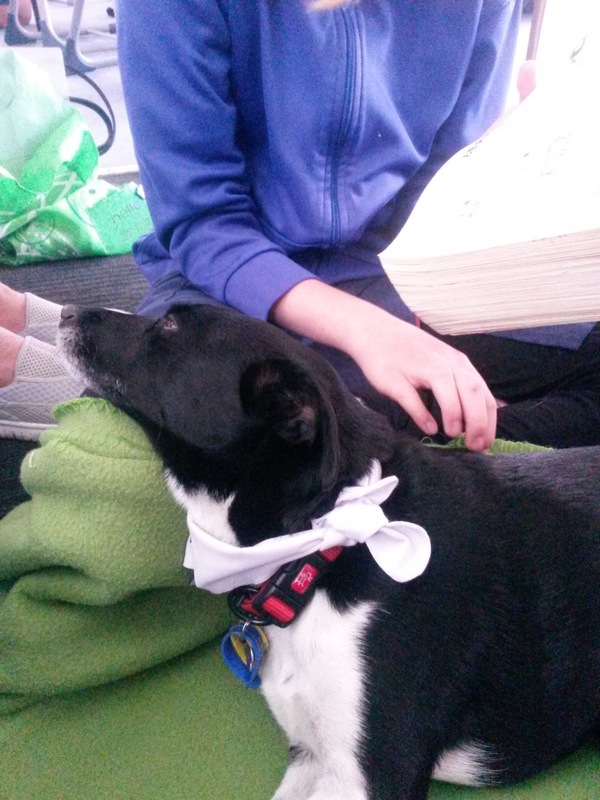 The library has a roomful of reading dogs, including a big white fluffy dog called Bonnie. Bonnie sits quietly and listens as Madeline slowly picks out the words and builds her confidence reading aloud, but just before her next big test Madeline visits the library and Bonnie isn't there! Can Madeline read out loud in front of the class without practicing with Bonnie first? This book was an absolutely delighful discovery, not only because it has such wonderful illustrations and characters, but also because it shows what reading dogs can do for children. I visit my local primary school with our little therapy dog each Friday, and we work with a teacher and his class. Today we took this book for the children to read and all three of the children who read to the dog chose to read the book. I did stress to the children that this is fiction - because children and dogs are never left alone for health and safety reasons, and because a pregnant dog and her puppies would not be able to visit - but it does show what a difference reading dogs can make in quite a realistic fashion. I will definitely be buying a copy of this book for our class, and buying at least one copy for me to keep - and I highly recommend this book for anyone involved with reading dog programmes because it is just perfect for children and adults alike.